I bought a 64G Transcend® JetFlash®710 drive from eBay recently as my previous "tiny keyring drive" (A Sandisk Cruzer Force) had passed-away due to some kind of mechanical failure (For once not the loop that secures it to your keychain/lanyard, but the plastic holding the flash-module inside the shell). In the past you always had to be wary of flash storage bought through eBay (The brand-name forgeries get more and more convincing as time goes on). So this article is covers my analysis of what I received. TL;DR: Looks genuine, but the transfer speed doesn't really benefit from the USB3 interface (Which is not unusual for most USB3 thumb drives today). It's still faster than any other USB flash drive I have. I bought this model of flash drive as it looked like a pretty robust enclosure but I'm not sure about the innards (which may fail like the Sandisk drive I mentioned before). It also has a USB3 interface, so I was looking forward to the increased access speed. To this end, I want to verify as accurately as possible whether this is a genuine item, that it has the stated capacity and determine what its read/write speeds might me. So that looks good: Holds ~50G well enough and can read at 43.5 MB/s. I thought I'd compare the write-speeds of some other USB3 media just for kicks, so I made a 1G random file like the 50G one above (So I could run the tests a bit more quickly and used much smaller drives) and wrote these to the various drives. I used dd to do the transfer as rsync would quickly dump the data into a cache somewhere and then just sit in a zombie state for a minute or so until synced. Using dd means I get a complete transfer rate from start to flush. Here's a class-2 MicroSD card connected through a USB3 card reader. Faster than anything else (even the Transcend read speed). But this is not surprising as this drive has much more involved cache, it's a single sequential write and the 50:1 file size difference is probably a magnifying factor in all that. 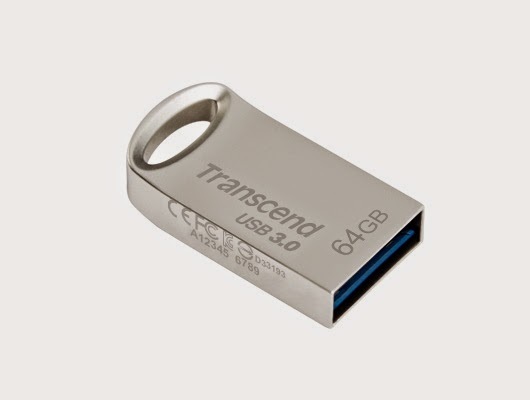 All in all, this is a fine thumb drive, it's not expensive, it has decent capacity and seems pretty rugged. Nevertheless the USB3 interface is not utilised well (Which is the same for most USB3 flash drives today), so it'd be nice to see improvements in this area.